Growing up, I always thought of 3000 strikeouts and 300 wins as the pitchers equivalents of 3000 hits and 500 home runs. Now, though, I get the feeling that it’s not necessarily the case. I don’t really have any single point that proves it, just a hunch built around small things. When a player gets close, the countdown to 3000 strikeouts gets some love, but not as much as those three. No one bothers playing “what if” about Mike Mussina reaching 3000 strikeouts like they do with 300 wins, despite the fact that he was even closer to the former than the latter (2813 K’s versus only 270 W’s). Everyone freaked out when Craig Biggio became the first (clean) 3000 hit guy in forever to not waltz in to Cooperstown two years ago, but there was no similar panic about his fellow ballot debut Curt Schilling struggling despite becoming the only (again, clean) 3000 strikeout guy not in. The funny thing is, 3000 strikeouts is the rarest of those four milestones. We’ve got twenty-four 300-win guys, twenty-six 500-homer guys, and Ichiro will be 3000 hit guy number thirty next season. But 3000 strikeouts? There have only been sixteen of those. Even when you account for the number of 300 win pitchers who were deadball guys*, it’s pretty even; since Walter Johnson (the first to 3000 strikeouts and a 300 winner himself), there have been fifteen 3000 K pitchers and fourteen 300 win pitchers. *Fun fact: seven of the 300 win club, or over one quarter, reached the mark before the first World Series was played. Even with the mismatch in appreciation, I think the 3000 strikeout milestone is important. And, since it’s much more closely tied to skill than wins, it seemed like the more sensible pitching milestone to measure like I have with hits and homers. One thing that surprised me as I did research was the relative modernity of the club. Six members have retired in the past decade; everyone in the club except Walter Johnson and Bob Gibson started in the ‘60s or later (and Bob Gibson just misses, starting in 1959). Even stranger was how the club has gone through barren stretches in that time. Nine members of the club debuted between 1959 (Bob Gibson) and 1970 (Bert Blyleven), with seven of those nine debuting between 1962 and 1967. Six more debuted between 1984 (Roger Clemens) and 1992 (Pedro Martinez), although five of those six debuted by 1988. (a year which saw Curt Schilling, John Smoltz, and Randy Johnson all throw their first pitches). I have no real explanation for that clustering, other than random chance. Anyway, a quick refresher on the methods I used in this series. First, I looked at the 3000 strikeout pitchers at each age. At each level, I broke the group into quarters (the top four, the next four, and so on). Then, I went through the history of the game and looked for how many pitchers had as many strikeouts at that age as the lowest member of each quarter. Then, I just took a simple percentage: the number of 3000 K guys in each quarter out of the number of pitchers with as many Ks. For example, using totally made-up numbers say through age 25, Pedro Martinez was fourth among the 3000 club with 200 Ks, while Don Sutton was eighth with 100. I would have taken every pitcher with as many Ks as Sutton but fewer than Pedro, say sixteen. Then, I would divide the four eventual-3000 guys by the sixteen total guys for a percentage of 25%. The one major change I made is that I also made a separate case for the outlier, since Phil Niekro was that far behind the second lowest guy thanks to his late start (peaking at 873 strikeouts behind the fifteenth guy). A few disclaimers, first. Since we’re dealing with such a small sample size, these are only going to be rough guidelines of a player’s chances. I’m also not doing anything advanced like factoring in aging curves or chance of injury, either. And I’m certainly not accounting for the changes within the game itself, like the recent shift to a more strikeout-dominated game. And that’s hardly the other shift in the game; for example, you’ll see that the top quarter of 3000 strikeout guys are barely in the top 100 all-time through age 23, but a ton of the guys ahead of them started at the age of 18 and reached age 23 before the World Series existed, so the game was a little different. So just keep that in mind; this fun and can be insightful, but this may not be the best work to go bet your life savings on. Now, with all that out of the way, let’s move on to the current strikeout leaders and their rough chances at reaching 3000. As mentioned, there’s some weirdness at this level. Over a third of the 91 pitchers above 443 mark debuted before the World Series even began, a truly anomalous result. On top of that, Phil Niekro isn’t an outlier yet, as Randy Johnson also had not debuted yet. Most of the weirdest stuff will resolve itself by age 24. Among current pitchers, a pair of Cardinals lead the way for 23-year-olds. Michael Wacha is at 265, while Carlos Martinez is right behind him at 235. Both are sort of in a weird middle ground between the upper half of the club (and it’s decent odds) and the lower half (and its almost non-existent odds). While those two are the only promising 23-year-olds, there are a lot of even younger players to keep an eye on. Jose Fernandez passes even those two, with 304 whiffs and counting. Other 22 years olds with some promise so far are Taijuan Walker (167), Noah Syndergaard (100), and Carlos Rodon (87). Plus, there’s Lance McCullers (78), who’s only 21. Obviously, there’s a high attrition rate for pitchers due to injury and such, but a fast start overall can’t hurt much. Just as age 23 is led by a pair of Cardinals, age 24 is led by a pair of Braves. Julio Teheran has 484 strikeouts so far, while teammate Shelby Miller (an ex-Cardinal himself) trails him at 423 through four fewer starts. There’s a lot more talent at this level too, including Gerrit Cole (368), Alex Wood (337), Trevor Bauer (299s), Yordano Ventura (240), and Kevin Gausman (171). Finally, we have our first “First Quartile” guy. Madison Bumgarner, through six years, stands at 1035 strikeouts and counting. It’s also worth noting that, while the first quartile percent looked a little low, we’re still in the an area where the weirdness hasn’t sorted itself out. Of the thirty players who reached 970 by the time they turned 25, eleven debuted in the 1800s. Apparently, it was common back then to debut even younger than Bumgarner did (who threw his first full season at the age of 20) and then retire when you got about as old as he is now. Using just modern players, Bumgarner’s odds look a lot closer to 50%, and in the next two or three seasons, we’ll see a lot of those types of players drop below the milestones we’re looking at. After Bumgarner, it’s a far drop off to Nathan Eovaldi (406) and Sonny Gray (381). Also, note that Phil Niekro finally debuted at this age, throwing fifteen innings in relief. Again, if we were removing 19th century pitchers from this grouping, we’d be looking at approximately 28.5% and 17% for the first two quartiles, respectively. Anyway, Chris Sale leads the way with 914 strikeouts, so he should waltz past the second quarter cutoff this season if he stays healthy. Behind him by about 100 is Stephen Strasburg at 809, then recent Red Sox demotion Rick Porcello at 747 and Jose Quintana at 539. I feel like Chris Archer (483) and Matt Harvey (386) are worth mentioning for their skill as well, even if their totals are a little low thanks to less playing time. They are ahead of some 3000 K guys’ paces, at least. Clayton Kershaw is absolutely blowing away the competition, with 1637 Ks and counting. He’s already among the top 10 all-time totals through age 27 (as is another active pitcher, who we’ll cover shortly), and he’s three behind where Bob Feller was at the same age. Which reminds me, it almost feels like cheating that Bob Feller doesn’t count as a 3000 strikeout guy, seeing as he finished with 2581 while missing three and a half seasons for World War II. Anyway, Clayton Kershaw’s in pretty good position, if the three Cy Youngs didn’t give it away. After him is new teammate Mat Latos with a solid 939 strikeouts so far. After him, though, it’s a big drop all the way to Trevor Cahill (732), Mike Leake (706), and Chris Tillman (591). They’ve all had their ups and downs this year, and while they’re ahead of some 3000-whiff guys, their pace makes it unlikely. I only bring them up though because, despite their various struggles, the next three names below them are Craig Kimbrel (534), Aroldis Chapman (509), and Kenley Jansen (495). At the start of this project, I idly wondered to myself if there might one day ever be a reliever who made a run at 3000. I feel like these three now provide a pretty solid “no” to that question. There just aren’t enough innings there. For as good as they are, Jon Niese (793) and Lance Lynn (728) will probably not be making a run at 3000 strikeouts. That other dominant 27-year-old I alluded to back there? That would be Felix Hernandez, who stood at 1703 Ks through his age-27 season. He’s been up to more of the same since then, with 2082 Ks to his name now. That figure puts him sixth all-time, right behind Nolan Ryan (2085) and right ahead of Sandy Koufax (2079). That’s pretty good company to be in. Other non-King 29-year-olds include Yovani Gallardo (1310), David Price (1285), Gio Gonzalez (1170), and Johnny Cueto (1122). 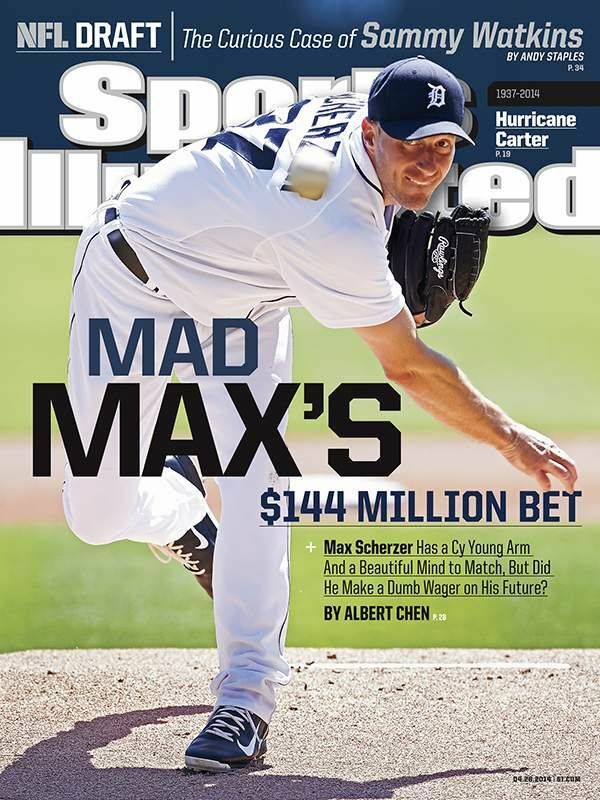 I do wonder if Scherzer breaking out relatively-late gives him an advantage in this scenario, though. Are pitchers who break out later in their careers more likely to maintain their dominance into their 30s? Maybe I’m just biased because of the players in the 3000 strikeout club. Randy Johnson and Curt Schilling both struggled to find their way early on. Bob Gibson through age 28 only had one All-Star appearance, a 71-57 record, and 940 strikeouts. You can see how behind the curve Phil Niekro was. And they aren’t the only ones: just in the recent past, I can think of Kevin Brown, Cliff Lee, David Cone, Roy Halladay and Adam Wainwright to a lesser extent (both were more mid-20s when they broke out, but they definitely weren’t super young phenoms)… All of whom broke out a little late and maintained dominance into their mid-30s. Maybe this is something I should look into more another time. *Given the resurgence of the movie series, I wish this had stuck as a nickname. No one here is going to hit the 2000 mark this year, but there have still been some good seasons all the same. Cole Hamels (1850) has been pretty good. Zack Greinke (1815) has been outright dominant. After them, there’s Tim Lincecum (1704), who’s fallen off something fierce. He looked like a strong bet four years ago, when he finished his age-27 season with 1127 strikeouts. Since then, though, he’s seen his K/9 fall 1.5, his ERA climb 1.70, his FIP rise 1.15… I really don’t have any explanation for what happened to him. Anyway, after them, it’s Jon Lester with 1593 strikeouts, and Scott Kazmir just over the second lowest cutoff (1428). Justin Verlander is the only 32-year-old beating the second-lowest total right now, standing at 1865. If he’s going to continue to post K/9 rates in the 6s rather than in the 9-to-10 range he was getting a few years ago, he’s not going to make it. Does he have a rebound in him? James Shields (1778) leads Oliver Perez (1333) and Adam Wainwright (1324). We’re quickly running out of viable candidates. For as mediocre as he’s been the past three seasons, CC Sabathia is still within striking distance of 3000 (pun not intended). Right now, he’s at 2534 strikeouts. It helps that he’s still been striking out about as many batters as he always has, but does he have enough in the tank to last the two or three more seasons that he’ll need? Do the Yankees keep him until the end of his contract? Do they keep him in the rotation that long? Does someone take a flyer on him after that? It’s hard to believe that this is the same guy who looked like such a sure thing a few years ago, finishing 2012 with 2214 strikeouts. Maybe a change to a pitchers park helps him extend his career? Or maybe he can become Bartolo Colon’s mentee and do whatever it was he did a few years ago (train in the Himalayas? Go on a spirit quest? I have no idea). Either way, something needs to change. Next on the list are Jake Peavy (2052) and Dan Haren (1969). Haren says he’s going to retire after this season, which probably rules him out. Meanwhile, Peavy’s probably slowed down a little too much to make it; he’d need something like another two-fifths of his career left. Maybe he makes it that long (who knows with pitchers), but that’s definitely not a bet I would take. Colby Lewis leads this age bracket with 847. Next. John Lackey (1892) and Mark Buehrle (1849) lead this bunch. About all they’ve got going for them is that they’re still ahead of Phil Niekro (who wouldn’t get his 3000 strikeout until he was 45, by the way). Also, though he hasn’t pitched this year, Cliff Lee has 1824 strikeouts. Aaron Harang leads with 1810. Again, next. If he really wanted to, A.J. Burnett could probably stick around and chase 3000 strikeouts. His injury makes it a lot more difficult, but he has about 500 to go (he has 2484) and he’s totaled 190, 209, and 180 the last three seasons before recording 114 this year. But 3000 strikeouts isn’t a milestone that you hang around into your 40s chasing like 3000 hits, and most indications are that’s he’s done after this year. Tim Hudson has 2069 strikeouts, which you might note is still lower than a player a decade his junior in Felix Hernandez. Also, like with Burnett and Haren, it sounds like Hudson is done after this year (not that he was close enough to 3000 strikeouts to stick around anyway, I just wanted to give him his due). The best of the rest are Bartolo Colon (2194) and R.A. Dickey (1179). So there you have it. How many of these players are likely to reach 3000 strikeouts? It’s tough to say. Pitchers are so fragile that it’s much harder to predict than the hitting milestones. Five or six sounds about right to me, just offhand; Kershaw, Hernandez, and Bumgarner seem like pretty good choices, I still think CC Sabathia can hold on and make it, plus two wild cards from the rest of the bunch (maybe Chris Sale and Max Scherzer, subject to change, although maybe one of the really young pitchers surprises). But will the Hall of Fame ever treat it like a milestone? That’s an even tougher question to answer. I liked your comment about this milestone results from an individual skill effort and not a team effort. 3KSO is a good HOF marker. Every 3K pitcher is in except Schilling, and he will get in when the writers quit inducing post-career antics.